Safety Emporium carries respirators to protect users from hazardous fumes, mists and vapors. A fume or fumes refers to vapors (gases), dusts and/or smoke given off by a substance as a result of a chemical transformation such as reaction, heating, explosion or detonation. "Fumes" generally conveys the idea that the cloud is an irritating, hazardous and/or toxic substance. The term applies particularly to very fine solid particles as a suspension in air. This closely matches the definition of dust, the main difference being that fumes are airborne whereas dusts need not be suspended in the air. The TiO2 (titania), is a solid that forms small white particles. The HCl (hydrogen chloride) is an invisible and hygroscopic gas that immediately condenses with water vapor in the air to form suspended liquid particles. The droplets in this HCl mist are acidic aqueous, solutions of hydrochloric acid. Inhalation of these fumes is dangerous because each component is hazardous. The hydrochloric acid droplets can cause chemical burns to the respiratory system, eyes and skin; the fine particles of titania further irritate the damaged tissues. Fumes generally require more careful attention than simple dusts or vapors. For example, while a dust mask might be sufficient protection from some dusts, a dust mask will do nothing to protect you from titanium tetrachloride fumes which contain corrosive HCl. Likewise, an organic vapor respirator will not protect the user from fumes containing HCl. Therefore, always try to control or eliminate the generation of fumes in the first place. 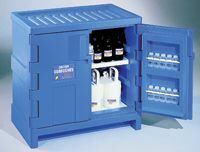 Use appropriate ventilation such as fume hoods and other engineering controls. If the fumes are not adequately controlled with these methods, always use proper personal protective equipment (PPE) such as supplied air respirators. Finally, note that many metal fumes, such as those generated in metal refining operations, soldering, and welding are significant health hazards. A general class of occupational disease is called metal fume fever. See the links below for more info. Metal Fume Fever, Safety and Health Fact Sheet No 25, by the American Welding Society. The Ontario Ministry of Labour has a lengthy report titled Health Effects of Welding and Cutting Fumes. The U.S. OSHA publication Occupational Safety And Health Guideline For Welding Fumes. CCOHS has a very readable entry on Welding - Fumes and Gases. OSHA's Additional info about the Respiratory Protection Standard including overviews, requirements, an FAQ and more. Dust And Fume Control In The Rubber Industry at the Health & Safety Executive (a United Kingdom government agency).